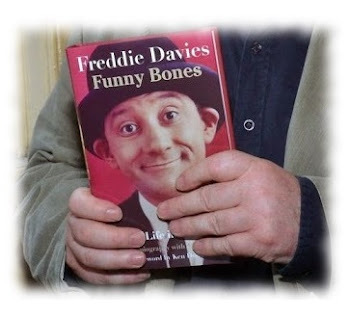 I was saddened to hear of the death of Ken Dodd, who contributed a generous and funny introduction to Funny Bones, the book I wrote with Freddie Davies; he can be seen, above, with Freddie in a photograph taken for the book at one of Ken's Good Turns charity functions in his beloved (the attraction was mutual) Liverpool. 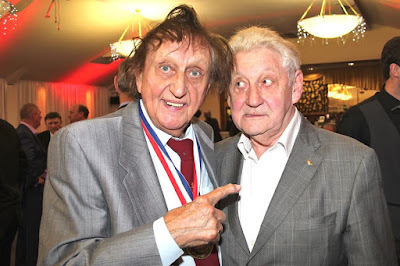 I looked up to people like Ken Dodd, as most young comics did: Ken was always very kind and helpful with young comics. I used to go backstage to see him and he always welcomed me: ‘Young man,’ he called me. At one time I could even feel myself working in his flowpath, but I thought: ‘Well, you can’t do better than emulate the master.’ Ken is very much a theatre comic. He started in clubs but really is a theatre man: larger, more fantastical, with a presence you can feel way up in the gods. I was fortunate enough to experience his generosity firsthand after a performance at the Liverpool Phil a few years ago when Ken chatted with me for about forty five minutes. Mention of a particular comedy book made him spin a mental rolodex: after a second or two before he delivered a definitive pronouncement on the writer - though when I made a passing reference to a well-known story about Laurel and Hardy's arrival in Ireland he was gracious enough to react as though he had never heard the tale before. When I left by the stage door at around half past one, despite the five and half hours they'd already spent in his company a long line of the faithful were still there, patiently awaiting one final glimpse of him.